The Mapex MA528SF Mars Crossover Drum Shell Kit, 5-Piece shell pack offers 100% birch, shallow depth shells with the SONIClear bearing edge, producing a fast, clear tone with a quick rebound. The Mars Series Crossover Shell Pack features a 1 up and 2 down configuration that is ideal for players who want a powerful rock sound with a single rack tom for closer positioning of their ride cymbal. - The Birch 6Ply 7.2mm shell, with the SONIClear Bearing Edge, allows for the direct transmission of sound, reduces unwanted frequencies and provides a strong fundamental pitch and an effortless tuning experience especially at lower tunings. - This 5-piece shell pack includes a 12" mounted rack tom, 14" and 16" Floor Toms, 14" Snare Drum and a 22"x18" Kick. - The SONIClear(TM) tom suspension and floor tom feet increase overall resonance by preserving vibration in the shell and keeping stress away from the tension rods, helping the heads stay in tune. Now you can get the hardware you need for your Mars Series Crossover Shell Kit. 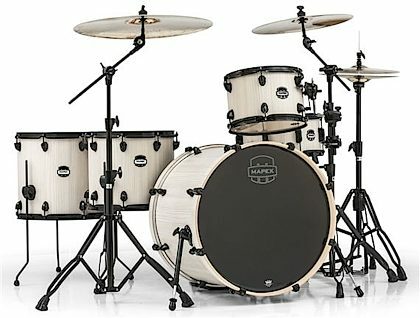 By choosing the "with Hardware" option, you'll get the sturdy-yet-lightweight Mapex Mars 600 Hardware Pack in either black or chrome. Overall: Wow, very impressed with this kit. I bought a similar kit a few years ago in the same price range by Pearl. I like the kit but I think this one is nicer. Love the black hardware. The bonewood is great looking and the hardware feels quality not cheap. Snare is good although I'll probably upgrade the wires on the bottom. Plus the set looks amazing set up. The pictures don't do these kits justice. You have to see them in person. Amazing! Very happy with this purchase. And zZounds, what can you say? They make buying music gear incredibly simple. Love this company! And good job Mapex! These drums are fantastic! Style of Music: I own a studio and pretty much play everything. Overall: For $600 this drum set will destroy anything else in that price range. The birch shells sound amazing all around. The finish looks gorgeous and the hardware is solid. Only thing is they skimped on the snare a little, the throw off is weak and the wires are flimsy, but its nothing a couple upgrades won't fix and once you do it will be as good as most snare you would buy stand alone.